Superb commentary on demos, Lance! I’ve been thinking about this myself lately. I made my own demos up until a couple of years ago. Frankly, I didn’t have the dough to have someone else do it for me! When I could afford it, I worked with Tim Keenan at Creative Media. He’s been a client for some time now and I thought hey, he records and produces this stuff all the time and probably knows a thing or two and knows what the corporate folks are looking for. Turns out I was right! Great dude, superb director, not at all a “Hollywood” personality, and it was an opportunity to reciprocate with someone who has hired me. Hiring the people who hire us as voice talents…there’s an idea! 🙂 Definitely a win-win. No joke, I book off my demos weekly. No audition required. Keep up the great work here on your blog! Blessings! Hi Anthony! Thank you and I’m happy to hear things went great with Tim. I didn’t realize this was a specialty of his. Nice job on your demo! Thanks for this post, Lance. I agree that eLearning demos are in a class unto themselves! For years, I used a self-produced eLearning demo featuring past projects that showed some range and was fairly dry (to demonstrate the quality of my studio). However, after working with Tim Keenan at Creative Media Recording on some eLearning modules, I decided to ask him to produce a new one for me. Tim isn’t a “traditional” demo producer, but because he works in the genre daily, he understands what corporate and learning clients are actually looking for when casting projects. The demo alternates between selections with music beds and dry segments. I sent the new demo to my existing clients, and they loved it. It was like giving them a glimpse at all the other things I can do that weren’t on my original demo or among the projects I’d booked with them. It’s so new, I don’t even have it on my website yet, but here it is on SoundCloud: https://soundcloud.com/sybiljohnson/sybil-johnson-elearning-demo-2019 (My old one is posted there, too, for comparison.) All that to say, as we grow in our skills, sometimes it can elevate our game to work with experts in the industry to create demos that appeal to clients in ways only an eLearning producer can see. Good luck to you! Hi Sybil, I actually really like your older demo! But the new one is very good too – but I feel like this is over-produced. This sounds almost like a corporate demo to me. In your older demo you sound like you are engaging and teaching, this feels, well, corporate, and that’s not your fault. I love the subtle touch of the wine glass ring and then discussing the wine in the older demo. I don’t know why Tim faded you asking the question in the first clip. That’s one of the most important things in an E-Learning Demo! Showing how you can effectively raise questions. I would have shortened the list of items, and then let you ask the question. Thank you for sharing this and I wish you success – I like your work! Thanks for this great read Lance. It’s a helpful and timely word, especially since there IS so much emphasis placed on the Commercial demo, yet E-learning is HUGE and the bread-and-butter for many VO artists. I worked with Tim Keenan, owner of Creative Media Recording for my E-learning demo. He serves numerous corporate clients in his studio and produces excellent E-learning demos because he knows exactly what corporate clients are looking for. All of the elements that you highlighted in your blog, Tim does to perfection. 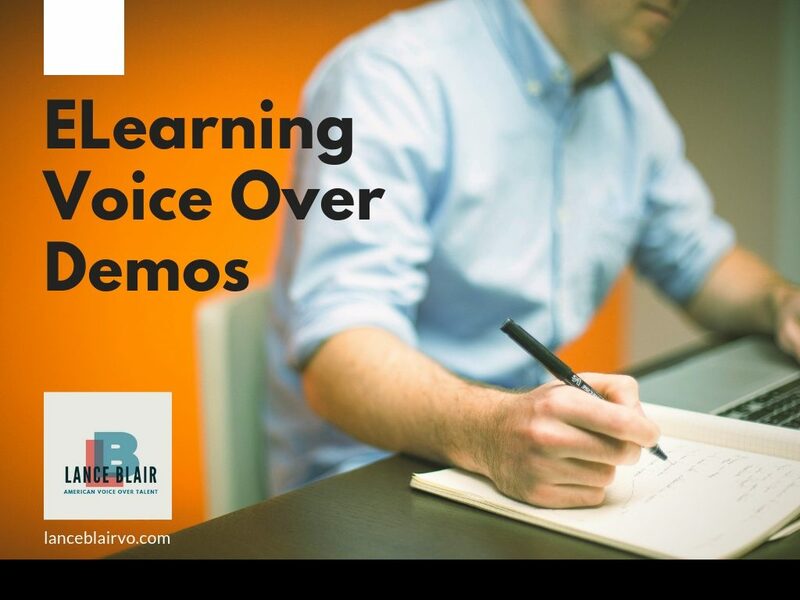 For VO talent seeking to get an E-learning demo, it’s essential to work with a producer who has a wealth of experience working with corporate clients; Tim’s E-learning demos get the talent work! Hi Leigh, thank you for your comment. I know Tim Keenan and that he does great work, but I didn’t realize that he does E-Learning Demos. He doesn’t come up in any searches for that. I suppose he’s getting plenty of referrals based on word of mouth and his reputation. Glad you had a great experience with him.